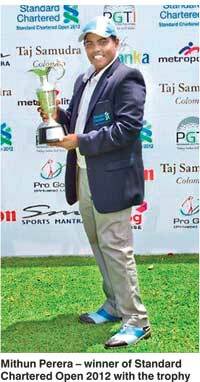 The Standard Chartered Open 2014 will once more bring a professional golf event sanctioned by the Professional Golf Tour of India (PGTI) to Sri Lanka to be held at the Royal Colombo Golf Club. The four day tournament scheduled from the 6 to 9 February 2014 will field over 100 professional golfers who will compete for the prize of USD 50,000. Standard Chartered Open 2012 winner Mithun Perera and Indian golfing stars Shiv Kapur and Anirban Lahiri will once more grace the event. Standard Chartered’s title sponsorship of the Standard Chartered Open 2014 affords local players the opportunity to showcase their talent at an international event. The PGTI has proved a springboard for the development of golf in India and provided opportunities for Indian professionals to compete at higher levels.